Available for the Kindle & iPad, Audio Book, or in Paperback. All memoirs bring the past into the present, but only a few manage to illuminate both simultaneously. French Hats in Iran, a quietly insightful masterpiece of remembrance, belongs in that select group. 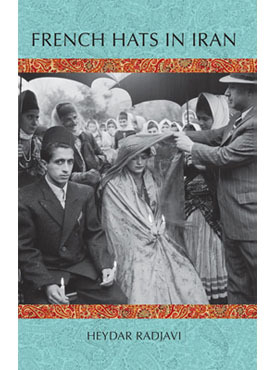 Heydar Radjavi’s evocations of growing up in Tabriz in the 1930s and 1940s describe a traditionalist Iran grappling with modernity, a process as fraught with contradictions and stresses then as it is in Iran today. In a series of mini-tales, we meet a rich cast of characters: the elderly father who works in the Tabriz bazaar and runs his household according to unbending religious precepts; the resourceful mother who finds ways to enjoy such forbidden frivolities as music; the female playmate who marries at the age of nine; the teacher whose personal journey takes him from strictest piety to political radicalism; and many more. Finding a path through all the complexities is Radjavi himself—a wide-eyed little boy in some episodes, an adventurous teenager in others, and finally a young man preparing to enter a fast-changing world. The tone is always light, the memories wonderfully vivid, and the underlying theme of tension between old and new truly timeless. From a gifted writer delightful, funny, evocative, enlightening, nostalgic stories about growing up in Iran in the 1940s. A must-read for anyone who wants to know how traditional, conservative Iranian households dealt with modernization. Heydar Radjavi describes each episode in his school years with lucidity and consummate art. He shows a very traditionalist Azerbaijani family grappling with modernity. The father and son are nicely contrasted in their own worlds. While the young Heydar is becoming part of a modernizing world, the father is clinging to his fast disappearing world. Heydar Radjavi’s memories of the 1930s and 1940s, when he was growing up in Iran (a country he describes as one that has been “in ambivalent flirtation with modernity for the past hundred years”), are a delightful and moving evocation of a vanished past. His wise, witty, gentle, and eminently humane voice is one that is irresistibly attractive, and the anecdotes he recounts have a quiet, resonant charm that stays in the mind long after the book is closed. This little book is a gem, as a memoir and as a human document. These are sketches of life in twentieth-century Iran, a nation in ambivalent flirtation with modernity for the past hundred years. The inevitable clashes with traditional beliefs, customs, and attitudes, at once comical and cruel, were experienced and are now reported in the following pages by one witness, this author, mainly through his childhood and adolescence. Frangi hats arrived in Iran half a decade before World War Two started. The ruling monarch at the time, Reza Shah, the father of the last Shah of Iran, must have considered this event as the culmination of his efforts in forced Westernization of his subjects. Dress reforms had been introduced earlier, but it was at this time that the old Shah ordered the nation to go all the way: any woman who ventured out of her house had to bare her face; any man or woman insisting on a head-cover had to wear one of the two prescribed types of these new “French” hats. Although the word Frangi can be translated as “French,” it has, for several centuries, had a much wider application for Iranians. It simply means anybody or anything European or Western. The Shah’s compulsory dress codes, seen by their stubborn advocates as an important ingredient of modernization and progress, and thus well worth the pain, proved extremely unpopular with traditionalists. The reforms and their consequences strongly colored the early lives of my generation among ordinary city-dwellers of Tabriz, as the stories attest. Frangi hats appear literally in several of the narratives that follow, and can be viewed as symbolically present in virtually all of them. Absolute accuracy in the narration cannot be guaranteed, of course. Pitfalls of memory, those unconscious revisions of personal history, are among obvious excuses for this, but there are others. Names of some main characters, ordinary folks who could not be remembered kindly, have been altered to prevent ready identification by their offspring. (The characters themselves, if still alive and able to read these reports from long ago and far away, will have no problem recognizing themselves.) Furthermore, some secondary characters with indistinguishable roles have at times been combined to keep the population under control. Each piece is meant to be read independently; so I hope the reader doesn’t mind an occasional reminder of a fact, an event, or a character already met in another story. One small warning: in the face of the current extreme violence engulfing that troubled region of the world, some readers might find the contents unfashionably, and perhaps idiotically, light-hearted. I have no excuses to offer. May light hearts reign once again. Heydar Radjavi was born and raised in Tabriz and did not leave that city until he was admitted to the University of Teheran in 1953. He was in love with modern Persian literature and dreamed of being a writer until he switched to mathematics at the end of high school (but that is another story). He was sent to the University of Minnesota, where he got his doctorate in 1962. He then taught in Iranian, American, and Canadian universities until he moved permanently to Canada in 1972. He now resides in Waterloo, Ontario, with his wife Ursula. He has published books and articles in mathematical journals, and has been known to most of his friends and acquaintances as a mathematician. This collection, French Hats in Iran, constitutes his first publication outside mathematics in 55 years.